"Hi, I want to play MKV files on my Mac with QuickTime player. I've already downloaded DivX Codec for mac but QT still can't open MKV." "How do I play MKV files in QuickTime with DTS sound?" "I registered my quicktime 7 pro and it says that the mkv file I am trying to open is not a movie file. I was told that quicktime 7 pro would open these files. Any suggestions?" Perian is a free, open source, QuickTime component that supports many popular media types. 1. Firstly it is discontinued and no longer supported although you can still download it. 2. Secondly it does not work in QuickTime Player X, it only works in QuickTime Player 7. There are many powerful free video player app such as VLC Player for Mac, KMPlayer for Mac and MPlayer for Mac that has enhanced media compatiblity with various different file formats. Although those players can play certain MKV file types, however, you may encounter other issues such as MKV files audio not working, some MKV files not opening, video play lagging, skipping or chopping, etc. If above listed solution does not work, then the most effective way is transcoding MKV to QuickTime Player supported video, audio file formats with suitable profile settings with a reliable tool called Pavtube Video Converter for Mac (best Mac Video Converter). Step 1: Input MKV Files into the program. Start the program on your Mac computer, click "File" > "Add Video/Audio" or "Add from folder" to load MKV video files into the program. 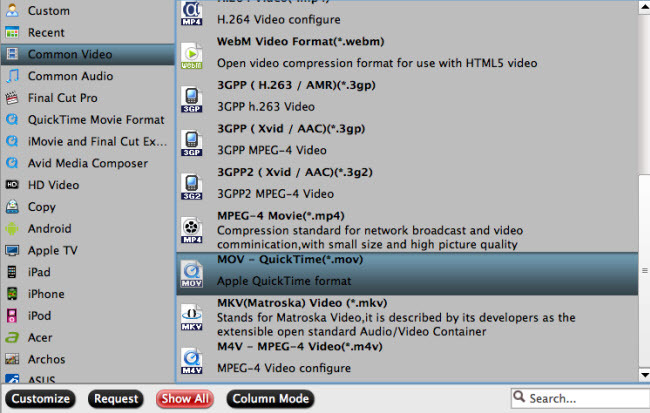 Click "Format" bar, from its drop-down list, define "MOV - QuickTime (*.mov)" as the output profile format. Click "Settings" on the main interface to open "Profile Settings" window, here you can flexibly tweak the output QuickTime player best playabck settings: video codec as H.264, audio codec as AAC, video resolution as 1280x720, video frame rate as 10fps or 15fps, video bit rate as 2-5 Mbps and audio bit rate as 196 kbps. After all the setting is completed, hit right-bottom "Convert" button to begin the conversion from MKV to QuickTime supported video and audio formats, codec and profile settings.